The Colorado Avalanche dropped a 5-1 decision to the St. Louis Blues on Sunday night. 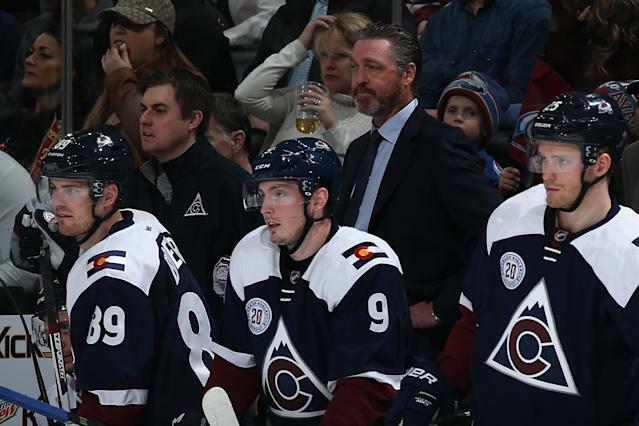 Their tragic number plummeted to two, meaning any two points gained by the Minnesota Wild or lost by the Avalanche will end Colorado’s playoff hopes. That could come Tuesday night. “I think we have a losing mindset right now. I think we have to believe more in ourselves,” said coach Patrick Roy. This is Roy’s third year as head coach. He won the division and lost in the first round of the playoffs in his rookie year. Since then, he’s gone 78-66-16 and will likely have missed the playoffs in consecutive seasons. This time, it’s with a whimper: While the Wild were in his sights, Roy’s team has lost five of six games. Frustration has saturated this locker room, and Roy’s was on display after the loss. His primary target: star center Matt Duchene. Duchene scored his 30th goal with 4:14 left in the game, making it 4-1 in favor of the Blues. He jumped in the air and celebrated his first 30-goal season in the NHL. Which is a bit like when a baseball team launches fireworks when someone hits a homer to break a 7-0 shutout. After the game, Duchene acknowledged that his personal achievement meant jack and squat in a lost season for the Avs. Meanwhile, down the hall, his coach was slaughtering him. “The thing I have a hard time with is the reaction of Duchy after his scores. It’s a 4-0 goal. Big cheer. Are you kidding me? What is that? I mean, it’s not the reflect that we want from our guys. Not at all,” said Roy. The coach went on to criticize the team’s core players for not being more like Alex Ovechkin and Sidney Crosby, whom he mentioned by name – for not being guys who step up when the team needs a goal. “I think we have some good leadership. Maybe not enough from our core. We need more from these guys. They need to prove to us that they can carry this team,” he said. Figuring out the next steps for the Avalanche will be GM Joe Sakic’s greatest challenge. Does he break up a core that his coach believes can’t carry the team into the playoffs? Does he break up with his coach, a good friend, because the Avalanche’s defense amounts to “Varlamov and heavy prayer?” Does he walk away himself? The Avalanche will have plenty of time to mull it over, without the playoffs as a distraction. Again.